New Titles Coming to the Free Library in July! When the calendar page turns to July, we know that summer cannot be denied. Escape is on most of our minds – escape from the heat and from the usual routines. Whether you take off to other locales or you escape in your mind while staying put, take these new titles along as a summer treat. 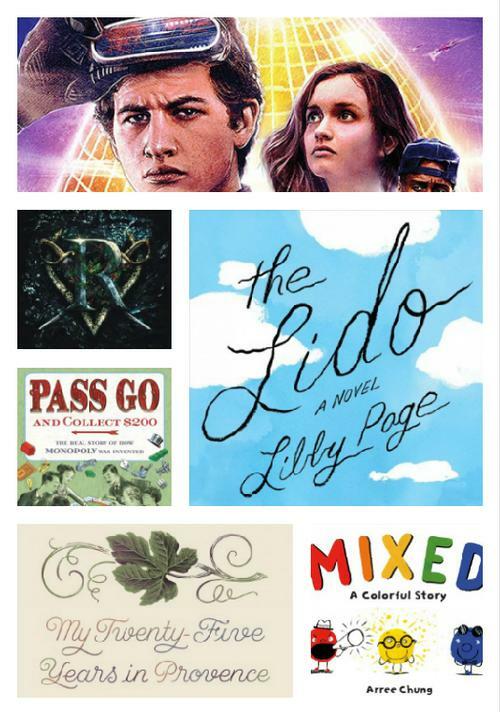 All are available in July at a neighborhood library near you. At first, the three primary colors, Red, Yellow, and Blue, lived side by side in harmony. But soon there was discord, and all three colors closed ranks and kept only to themselves. Until one day, Blue and Yellow fell in love and a new color was born: Green. Soon, all the colors started coming together again, opening themselves up to new color discoveries. A book about color theory that also doubles as a book on prejudice and tolerance – it’s a winner! Ever wonder how the classic board game Monopoly was invented? This informational picture book tells all, including who the original inventor and patent holder was, who made the most money from the invention, and how it changed over the years. There’s even some Monopoly trivia and a math section. A great family read, recommended for ages 5-10. Kate is a twenty-six-year-old riddled with anxiety and panic attacks who works for a local paper in Brixton, London, covering forgettable small stories. When she's assigned to write about the closing of the local lido (an outdoor pool and recreation center), she meets Rosemary, an eighty-six-year-old widow who has swum at the lido daily since it opened its doors when she was a child. It was here Rosemary fell in love with her husband, George; here that she's found communion during her marriage and since George's death. The lido has been a cornerstone in nearly every part of Rosemary's life. What begins as a simple local interest story for Kate soon blossoms into a beautiful friendship that provides sustenance to both women as they galvanize the community to fight the lido's closure. In the tradition of Frederick Backman, The Lido is a charming, feel-good novel that captures the heart and spirit of a community across generations—an irresistible tale of love, loss, aging, and friendship. Fans of Peter Mayle who have read his chronicles of life in Provence, starting with his popular first book, A Year in Provence, written in 1990, will be delighted that he left us with this final volume. Here he offers charming anecdotes and thoughtful, vivid recollections from his twenty-five years in the South of France—lessons learned, culinary delights enjoyed, and changes observed. In the year 2045, the world is on the brink of chaos and collapse. People escape their harsh reality in the OASIS, an immersive virtual world where you can go anywhere, do anything, be anyone—the only limits are your own imagination. When the creator of the world dies suddenly, everything is in flux. A mysterious video reveals that he has left his immense fortune and control of the OASIS to the winner of a contest. Find the digital easter egg that is hidden somewhere in the OASIS and become the heir. The contest grips the entire world. Unlikely hero Wade Watts conquers the first challenge of the reality-bending treasure hunt. He and his friends, known as the High Five, are hurled into a fantastical universe of discovery and danger to save the OASIS and their world. Adapted from Ernest Cline's best-selling book. These new titles and more will be available in July at a neighborhood library near you! Add a Comment to New Titles Coming to the Free Library in July!